This article is for all those who have friends in the Netherlands, have been looking for an excuse to visit Amsterdam, or are living there. It is about the latest monthly blockchain and cryptocurrency event that focuses on providing as much value to visitors as possible. Limited ICO pitching format combined with networking and a strong focus on sharing knowledge. We’ve visited the Bitcoin Wednesday conference in Amsterdam last year. We were there for three consecutive months, and even happened to be there for their 4th Year Anniversary (48th event), and then finally said goodbye in August 2017. They’ve continued to have their events, but you cannot ignore this new, trendy event that is promising to shake the foundations and breathe new life into the crypto scene in the Netherlands. The new kid on the block is called BlockchainTalks. They are led by a young, vibrant team of high energy blockchain enthusiasts, who want to share their passion with the world. Their story is young and in its infancy, which is another way to say, the party is just getting started. They’ve already generated 10 events together, most in Amsterdam and some in Rotterdam as well. The reception from audiences has been nothing except amazing, with most people finding it refreshing to see high-quality speakers and content being presented, most of them referring to the very interesting innovation from the BlockchainTalks team called ICO Shark Tank. What is ICO Shark Tank? The idea is simple. ICOs pitch and blockchain experts get to ask all of the important questions. The entire thing is live-streamed to the internet via Facebook. It’s natural for ICOs to need a place to share their project with the community. Of course, nothing is for free, and the opportunity to get roasted in front of a large crowd costs ICO founders ~440 Euro. They find it quite useful because the projects are usually challenged and pushed to the maximum. This tends to bring out any error in thought and if we are being honest, most (if not all) ICOs have a lot of weaknesses. Once you start building something you get passion-blinded and fail to see the small, but obvious inconsistencies in your project. Keeping an open mind and bracing for heavy feedback, you can gain such insight in a short period of time that it significantly improves the quality of your project’s development. This meetup is not only about blockchain, although most of the speakers are strongly involved in the industry. The types of topics have ranged from artificial intelligence all the way to tax and legal insight for cryptocurrency miners. The range is wide and speakers varied which combined with a strict selection process enables the meetup to provide maximum value for attendees. Investor knowledge that most people lack. Data and how to be smart with it. Buy, Sell, everything related to trading. The role of money and corporate finance. How to use crypto to escape your government’s financial mistakes. And other interesting topics, which stimulate a lot of interesting conversations when it comes time to network with other people attending the meetup. Speaking of which, the ticket to attend this conference is about 10 Euros if you get it early, but we don’t have the information about what the price is at the door. It is a pretty good one time in the month investment to keep yourself plugged in the cryptocurrency and blockchain ecosystem. 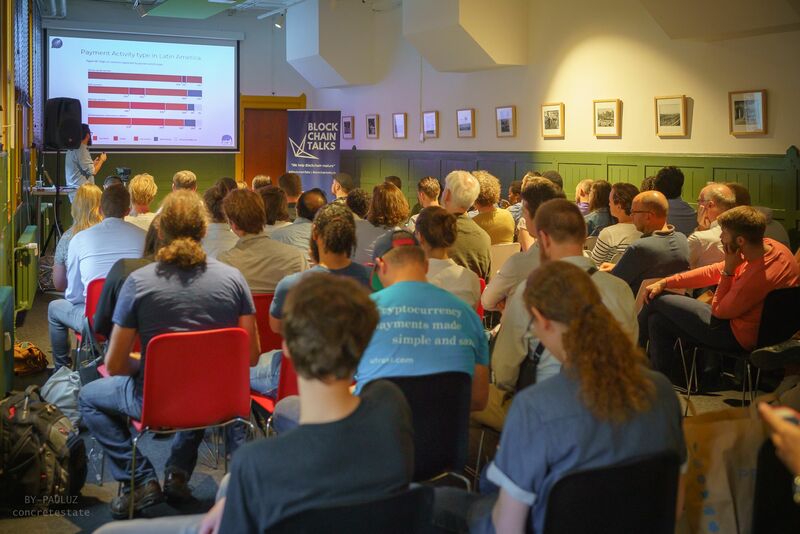 One thing is for sure and that is the fact this meetup is growing rapidly, which is a great sign of the interest in blockchain technology in Holland. I’ve never been to one of their events, but my involvement with Amsterdam’s crypto scene has allowed me to hear about it, and I will be more than interested to visit this event, next time I am in Amsterdam. Maybe that will be my main excuse to go back there. In comparison, at events in Macedonia the attendance has been varied, and stagnant. At maximum, events had 17 people attend the same time, which is not a great number. Considering that the most popular Facebook group is about 1000 users, realizing that barely 1.7% of the community want and are willing to meet is a little bit discouraging. Yes, that’s a great idea and I will do it. No, that’s a terrible idea and I would never do that. Maybe I will, maybe I won’t. Number one and two are great answers. You know what you want, care about, and are willing to do to support blockchain adoption. The third one, however, that one is dangerous. Dangerous because it leads to inaction, and inaction breeds procrastination, doubt, and worries. So can we promise each other that we will decide on either a “Yes” or a “No”, but not a mediocre “Maybe”? Organize your own local blockchain meetup, even if there is a meetup already happening in your town. Use the #CryptoNewsChallenge, so that I know how to find you on social media, and leave a comment below right now. I will get in touch with you via email after you do that and will collect all of the information you provide me. I promise to write an article about all of the events that spring up because of this article. If you pick up this challenge you will create a meetup and bring together people to talk or watch presentations from other knowledgeable individuals. It’s a creative process, and you can decide it all.